It is early afternoon when we start our tour of the market. We find Catherine is cleaning fish heads and bodies when we come to see her, a small wood fire set within three large stones is smouldering a small distance away and soon she will be ready to stoke the fire up and to start frying her fish. She has a good patch close to the entry of the market and the news is that Catherine is very popular and has plenty of customers. Catherine leaves Usa River early each morning to buy fresh fish at Kilombero Market, in Arusha Town. By 1pm she will be back ready to clean the fish which she will start frying from 3pm until 9pm, unless she sells out early. She also fries chips and bananas. Should there be any fish left over she can ask her friend with a fridge if she can put the fish in her fridge overnight. Mondo’s grant of 250,000 Tanzanian shillings helped Catherine to set up as a Mama Lishe (food stall vendor) in the market. 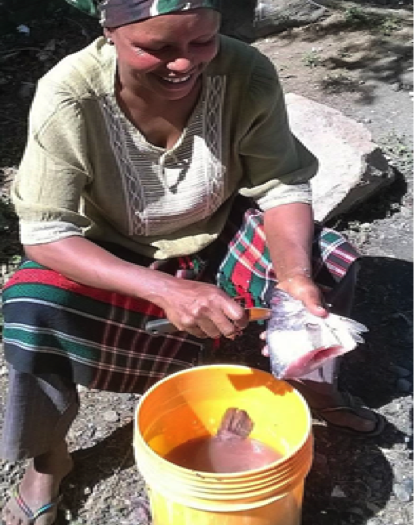 She was able to buy all the necessary items, buckets to transport the fish from Arusha, cooking pots and pans, knives, firewood, kerosene and the capital to buy the fish, potatoes and cooking bananas. Cooking fish has not always been her work. Originally she was selling oil in the market, near to her home. It was hard work and not very profitable so she was finding it difficult to look after her two children, Nema 12 and Jacqueline 6. Now she feels happy that she can give the children a cup of tea in the morning, a good lunch of ugali (maize meal) with spinach and/or beans and a good evening meal as well. James Ruby’s job as community care worker involves visiting people who attend the HIV clinic at the Health Centre. He follows up with many people as he walks through the market or in his trips around the community. He knew Catherine from the clinic and saw how hard she worked and encouraged her to do approach Mondo for help as he felt she could do even better. Catherine’s business is certainly growing and she is very grateful for the help that Mondo has given her. If you would like to help support more women like Catherine, we are currently raising funds for our next round of grants and loans. To help us achieve our target you can donate here.